Connoiseur Electronics Pvt. Ltd offers a quad-port 1Gb Ethernet(GbE) Network Interface Card (NIC) for rack and tower servers. Connoiseur Electronics Pvt. Ltd offers a quad-port 1Gb Ethernet(GbE) Network Interface Card (NIC) for rack and tower servers. It leverages Broadcom’s long-standing industry leadership in Ethernet, providing the highest levels of performance,efficiency, and scalability for the enterprise data center. 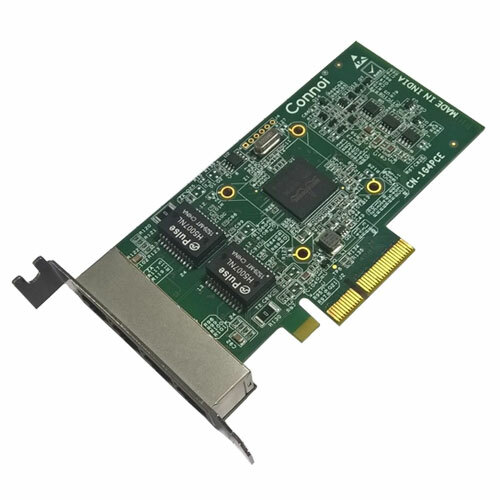 Designed for today’s enterprise, the Connoi® CN-1G4PCE , a Broadcom BCM5719 controller based NIC adapter is the ideal solution for multicore servers, delivering full line-rate through-put across all ports. The adapter utilizes Broadcom’s quad-port BCM5719 integrated controller to deliver lower power consumption Energy Efficient Ethernet™ (EEE), reducing IT and operation costs. Increasing application workloads are placing greater demands on enterprise networks, and the Connoi® CN-1G4PCE quad-port 1GbE NIC is the solution of choice for such environments, providing a reliable, high-performance, energy-efficient 1GbE connectivity solution.